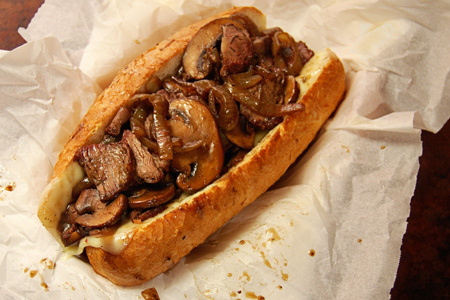 I know that you might be thinking, "Another Philly cheese steak recipe? Really?!" Yeah, I'll admit that I initially thought the same thing as I was putting this recipe together. However, let me assure you that this is a cheese steak that packs a top-shelf punch. There are relatively few times when I have a mess of steak leftover. In this case it was due to me finding an absolutely killer deal on some chuck eye steaks. I bought all they had and figured that I'd worry about what to do with them later. Let me digress for just a moment. If you've never heard of or tried a chuck eye steak, do yourself a huge favor and remedy that situation. Frequent readers know that I've occasionally preached the virtues of the flat iron steak. Well, the chuck eye is another little-known bargain cut that eats like a steak of at least twice the price. Both come from the chuck primal and are simply outstanding on the grill. Now back to the task at hand -- a cheese steak elevated. Since this steak is so good I wanted to come up with a recipe that would be something special. Give this a try and let me know if you agree. 8 oz Grilled steak, sliced to 1/8"
Heat the butter and oil in a large saute pan over medium-high heat until the butter is melted and starting to foam. Add the garlic to the pan, reduce the heat to low and let cook about two minutes, stirring occasionally. Remove and discard the garlic. 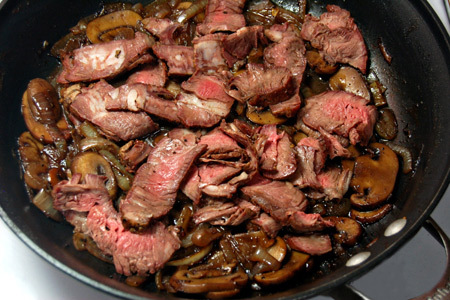 Return the pan to medium-high heat, add the pepper, onions and mushrooms. 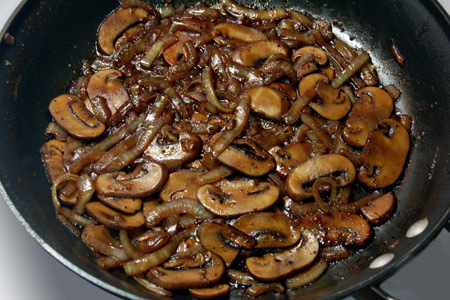 Saute until the onions are translucent and the mushrooms are tender (about 10 minutes), stirring or tossing frequently. Reduce the heat to medium, add the wine and Worcestershire sauce to the pan and cook 5 minutes, stirring or tossing frequently. Add the steak to the pan, reduce the heat to low, and cook just long enough to heat the steak through, about 5 minutes. Line each roll with enough sliced pepper jack to cover it. Fill each roll with an equal amount of the steak mixture. John, you had me at butter. And porcini mushrooms. And red wine. YUM!!! That is a "face jammer" sandwich and I love it. Never thought of pairing pepper jack cheese with a philly sub but it totally makes sense and kicks it up. I should mention another great variation on this recipe. Last night I split a loaf of French bread in half lengthwise, schmeared one side with pizza sauce, laid on a thick layer of the philly filling and topped it with sliced pepper jack. I then baked it at 375* for about 15 minutes. Man! That was even better than the original sandwich! You can't go wrong with a good Philly!!! I want to try this next week but I will be preparing it for someone who does not drink any alcohol. What can I use in place of the wine. Anonymous - Just use alcohol-free wine, or leave it out. P.S. All of the alcohol cooks out. Philly cheese steak sandwiches are one of my favorite reasons for grilling a little to much steak the night or two before. I have a flat top griddle that goes over half of my gas BBQ so i just saute the vegies there, add the sliced beef towards the end and melt the cheese over the mixture at the last minute and spatula it into the bun. The flat top griddle adds a lot of versatility to the BBQ, allowing you to make a lot of great breakfasts on the patio too, although not so much this time of year. Great blog you've got here and I can tell I'm going to love following you. I found you over at Robyn's site. I'm in Colorado and have to admit I think we have one dedicated Philly Steak joint, and I've never tried making one. I'm pinning this and will try it after the holidays. I cook for men in my house, 4 boys, 2 of which are athletes, and the hubby. I think I'll be a frequent visitor of your site! This sandwich would make them all very happy. Killer sandwich! My husband and I both loved it and will definitely make it again!